No matter where you go, you are sure to find a board saying 'Andhra meals' or 'Andhra cuisine' welcomes you. Most of the people think that Andhra food is way too spicy. They also have an impression that Andhra food is plain dal,some curry and podi/chutney. Andhra food is highly versatile. 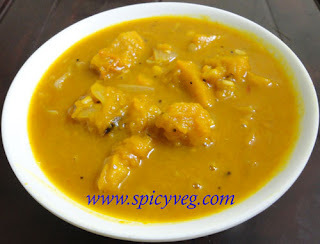 You will be awed at the variety of the dishes and the tastes.One of them is Gummadikaya Pulusu or Pumpkin Stew tangy and sweet vegetable stew is such a dish, which is savoured by everyone. conversion to vitamin A, beta carotene performs many important functions in overall health. 1.Peel, clean, remove the seeds from gummadikaya/pumpkin and dice. 2.Heat the oil in a deep pan on medium heat and add channa dal, urad dal, red chilli and fry , add cumin and mustard seeds once the dals starts turning into golden brown and allow them to crackle, add hing and saute for 1-2 minutes. 3.Now add green chillies, garlic, ginger, turmeric and saute for couple of minutes. 4.Now add sliced onions and fry till translucent. Add the diced pumpkin salt, jaggery, tamarind and cook for 3-5 minutes. 5.Pour 2 cups of water and reduce the heat to medium low and cook for 10-12 minutes the covered. Keep stirring in middle. At this point the veggies will be 3/4th cooked. 6.At this stage adjust the seasoning if needed and water if the stew is thick. Cook for another 5-8 minutes or till done and turn of the heat. 7.Serve with rice and dollop of ghee.